1 Rinse the parsley, shake dry, pluck leaves and chop finely. 2 Rinse the scallions, wipe dry and cut into thin rings. Drain and chop the capers. Finely chop the olives. 3 Squeeze out lemon juice. Whisk together the parsley, scallions, capers, olives, olive oil and 1 tablespoon lemon juice in a bowl, then season with salt and pepper and let stand for about 30 minutes. 4 Fold a kitchen towel several times and place 1 oyster with the round side down on the towel. 5 Place the towel over the oyster. Holding the shell with one hand, and using the towel as protection, insert the tip of the oyster knife on the tapered side of the oyster between the shell halves. 6 Press knife blade as deep as possible between shell halves and pry them apart slightly by carefully turning the knife, then slide the oyster knife along the upper shell inside the oyster to release the oyster. Discard upper shell halves and keep oysters in the bottom shells. 7 Remove any broken pieces of shell. Repeat to open remaining oysters. 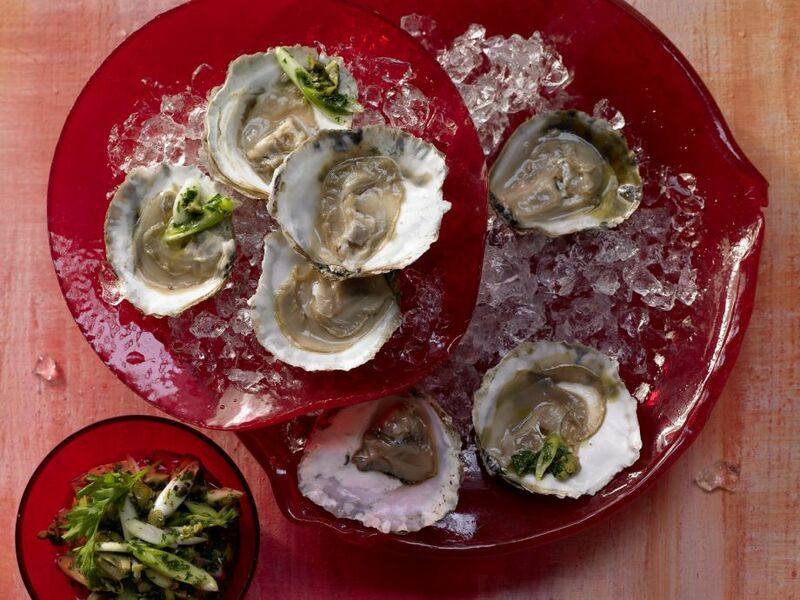 Arrange oysters in shells on a plate lined with ice. Serve with the sauce. Love oysters! Perfect for the Paleo diet.